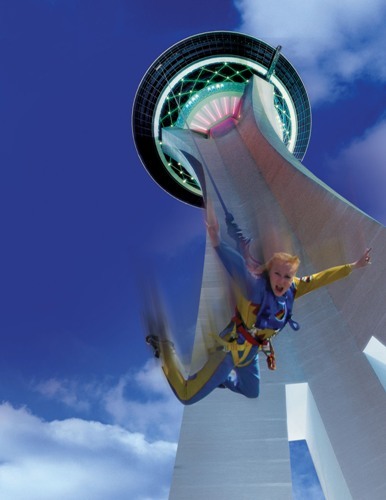 Stratosphere Las Vegas Hotel & Casino just opened what may be the ryear's most exhilarating ride - a 108-story free fall. Sky Jump is most easily imagined as jumping out of plane, with no chute. Well...not exactly. There is this cable attached to your harness so you don't splat all over the ground when you arrive back on terra firma. Actually, it's better than bungee jumping because there's no bounce back. Jumpers are outfitted with a special Stratosphere jump suit, complete with appropriate safety harness. The safety harness is then connected with the patented high-speed descender machine. Formerly the world's highest commercial decelerator descent was set at Macau Tower Convention and Entertainment Centre with a height of 764.4 feet. To read entire article, go to my Examiner.com site.